• Honor® Show Chow® Grand Lamb Mixer DX concentrate is a blended supplement containing a nutritious pellet (containing soybean meal and linseed meal) that can be mixed with steam rolled barley, corn, oats and molasses to make “custom” high quality show lamb diets. This flexible feed allows you to adjust the grain level to fit your needs for breeding ewes, growing lambs or finishing lambs. • Purina Lamb Grower – Pelleted 14% protein, 2% fat non-medicated Lamb Grower continues to build off of our lamb starter. • Purina Lamb Finisher – Our 14% protein, 2% fat Lamb Finisher is non-medicated & designed for fattening slaughter lambs. • Honor® Show Chow® Flex Lamb TXT B30 is a highly-palatable, textured feed designed as a Starter/Grower/Finisher for show lambs, replacement ewe lambs, rams and the entire breeding herd. • Honor® Show Chow® Showlamb Creep Pellet DX feed is designed as a creep feed for show lambs through weaning. This feed is pelleted and medicated with Deccox® to help prevent coccidiosis. • Honor® Show Chow® Showlamb Grower DX feed is a completely balanced, high energy feed for growing show lambs and breeding sheep. 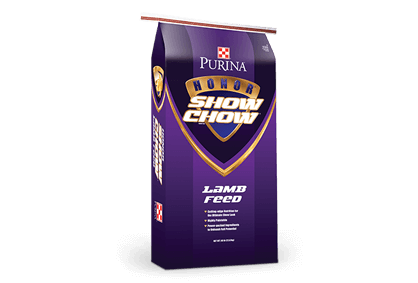 Honor® Show Chow® Showlamb Grower DX feed is supported by Purina knowledge, experience and research. An All Purpose Sheep Mineral. 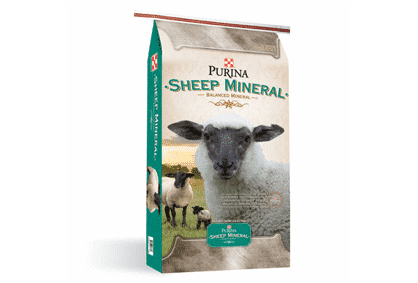 Purina® Sheep Mineral provides your sheep with a balanced mineral program that can be fed year-round.